Probably one of the most delicious snacks I’ve made. I cannot say how much I absolutely love these. 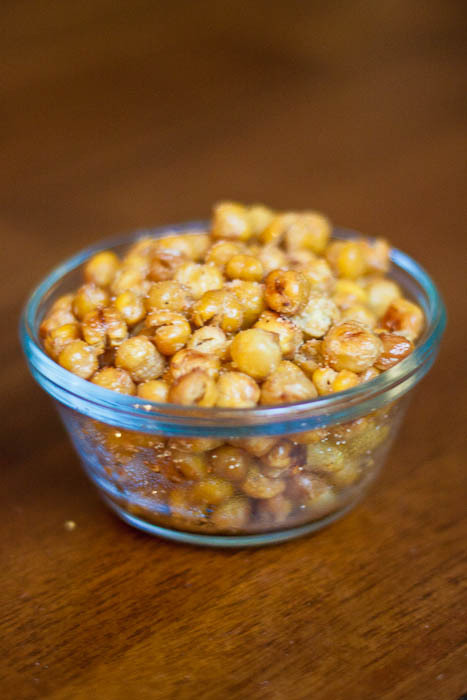 If you like corn nuts, pretzels, chips or anything salty and crunchy, these are for you. I plan on flavoring them a lot of different ways. I made TWO CANS worth of them and my kids and I ate them ALL within 15 minutes. I got the instructions from Steamy Kitchen. This batch I made from canned chick peas but they varied in such size and some not even being whole that I bought 2 pounds of dried chick peas in bulk yesterday and those peas are more uniform in shape and size to ensure even baking. Honestly, it’s like an eight of the price. Just let them soak overnight. I let these bake 30 minutes, next time I’ll up it to 32 minutes. Some were crunchy, but some were still soft but still tasted so good! 2. Drain the can of garbanzo beans in a strainer and rinse with water for a few seconds to clean off the beans. Shake and tap the strainer to rid of excess water. Lay paper towel on a baking sheet, and spread the beans over. Use another paper towel to gently press and absorb the water on the beans. Roll the beans around with the paper towel to also remove the thin skin from any of the beans. Discard the skins and the paper towels. 3. Drizzle the olive oil over the beans and use your hands or a spatula to toss around and coat. Roast for 30-40 minutes until the beans are a deep golden brown and crunchy. Make sure that the beans do not burn. 4. Season with salt and spice blend. Stealing my idea!!! Didn’t we just talk about this on the phone? They look like corn nuts.